Full-size SUVs have taken a beating as of late. First, there was the gas crisis of 2008, followed by the economic crisis of 2009, a one-two punch that had many predicting the demise of the gargantuan family haulers. But, like most things prone to exaggeration, the worst never came. Why? 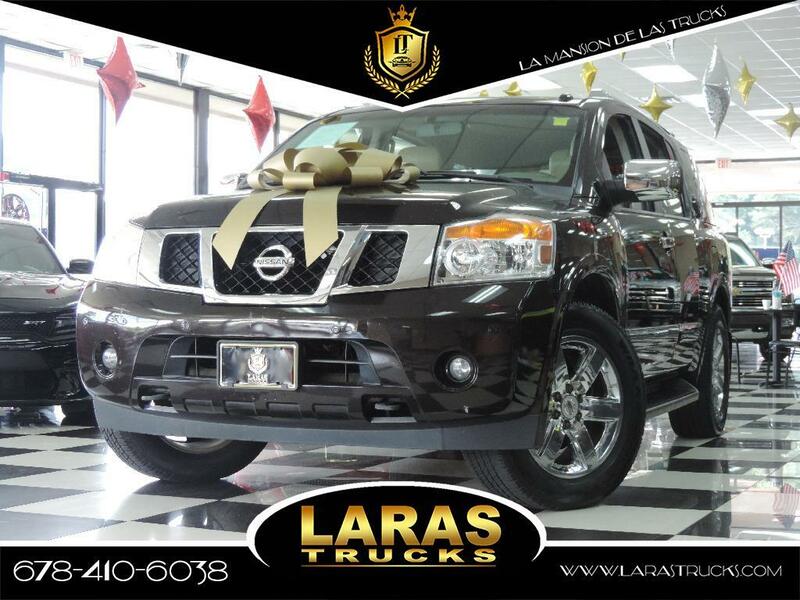 Because, for those families who need room for eight passengers and/or the ability to tow a 9,000 pound trailer, there is no substitute for a vehicle like the 2011 Nissan Armada. Sure, the $100 fill ups won't go easy on the wallet, nor will the $40,000 asking price, but if you can't live without the above listed features, there are only a handful of similar vehicles that can accomplish what the Armada can. The aptly named Armada is as big as tank, and sometimes drives like one, too. Don't look for an easy go of it in tight parking lots or narrow garage openings. Oddly, heated front seats are only available on the most expensive trim. For 2011, two of the three Armada trims are renamed. The Armada SV replaces the previous SE, and the Armada SL replaces the Titanium trim. The 2011 Nissan Armada's size might have you thinking it should handle like an unruly pickup truck, but in reality it feels more like a midsize SUV. The Armada's short front and rear overhangs make it possible to maneuver around close corners without guess work, aided by steering that is taut and fairly precise. On smooth pavement, the Armada sails along with little drama, but upon encountering rough seas-uneven pavement or large expansion joints, for example-the Armada's Titan-based roots quickly make themselves known. The Armada's suspension doesn't do a very good job of isolating road imperfections, choosing instead to send the slightest rude jolt or annoying vibration into the passenger cabin. Of course, with 317 horsepower on tap, you can quickly accelerate to find better roads, or at least have a lot of fun making the attempt. The Armada's versatile rear-seat design includes fold-flat seats that create a level loading floor. The Armada's standard head-curtain airbags cover all three rows of seating. The 2011 Nissan Armada offers a number of interior configurations designed to fit the multiple needs of a growing family. The second row can be fitted with a bench seat, or two captain's chairs divided by a removable center console. With the console in place, second-row passengers have a place to store water bottles and video games; take it out, and passengers have an unobstructed passage to the third-row seat. The rear-most bench seat is slightly elevated (a term known as "theatre seating") allowing its occupants to see over the heads of those up front. When not hauling passengers, the Armada's seats can be folded creating a level floor perfect for carrying long or bulky items. Those concerned about safety can take solace in the Armada's many safety features, including side curtain airbags covering all three rows. In the world of conservatively styled SUVs, the 2011 Nissan Armada's expressive design stands out as one of its strongest attributes. From its arched door frames, to its raised roof, to its huge side fender flares, the Armada is not easily mistaken for anything but and Armada. Some of the styling places form over function, however, such as the high positioned rear door handles that can prove a difficult reach for smaller children. A generous expanse of glass combined with narrow roof pillars provides good 360 degree visibility, and Nissan's huge side mirrors reveal all objects near the Armada's sides. On Platinum trims, the side mirrors include a power folding and auto-dimming feature. The 2011 Nissan Armada SV has a 317-horsepower V8 engine, five-speed automatic transmission with tow/haul mode, four-wheel anti-lock disc brakes (ABS), front and rear air conditioning, floor- and ceiling-mounted consoles, Vehicle Dynamic Control, rear privacy glass, dual power heated outside mirrors, power windows, power locks, remote keyless entry, power-adjustable pedals, AM/FM stereo with six-disc in-dash CD changer with MP3 capability, front and rear head-curtain airbags (covering all three rows), front side-impact airbags, running boards, eight-way power driver's seat, cruise control, tire-pressure monitor and a rear wiper and washer. The SL adds Intelligent Key keyless entry and start, leather seating, RearView Monitor, Bluetooth, Bose audio, power-folding third-row seat and auto-leveling rear air suspension. The Platinum Edition includes all these features plus heated front seats and steering wheel, a power liftgate, power moonroof, a hard drive-based navigation system and rear-seat DVD entertainment. Options for the 2011 Nissan Armada vary by trim. The SV can be equipped with the Driver Package that adds a 12-speaker Bose audio system, Bluetooth, RearView Monitor, fog lights and a power-folding third-row seat. Also available on the SV is the Tow Package and a number of dealer-installed options. The SL can be equipped with a rear-seat DVD entertainment system and a power moonroof, while the Platinum Edition offers second-row captain's chair seating. All models offer the option of four-wheel drive. Nissan equipped the Armada with its most powerful V8 engine and the results are impressive. Tow rated at 9,100-pounds (with the available Tow Package), the Armada credits itself well in maximum towing capacity among lighter-duty, full-size SUVs. The two-wheel-drive Armada SV has a Manufacturers Suggested Retail Price (MSRP) starting just under $39,000, while the same model with four-wheel drive comes in just under $44,500. The SL trim ranges from about $44,000 to $46,600, while a fully-loaded Platinum tops out around the $56,000 mark. A look at the Kelley Blue Book Fair Purchase Price shows the typical transaction price paid for an Armada in your area, so be sure to check it out before you begin negotiations. Also be sure to check the Incentives tab to see what deals the manufacturer may be offering. In the all-important world of resale, the Armada is projected to retain an average residual value, slightly lower than the Chevrolet Suburban and Ford Expedition, and well below the value retained by the Toyota Sequoia.